I am a die-hard Bridget Jones’s Diary fan. If someone starts to say, “Do you know…” I immediately mentally fill in, “…where the toilets are?” and I’m pretty sure if I ever saw Salman Rushdie in person, I’d be like, “Loved your work at the Kafka’s Motorbike book launch.” Obviously, when it was announced that Renee Zellweger would be returning for the third installment in the film franchise, I was beyond excited, and when the trailer for Bridget Jones’s Baby was released earlier this week, I went through such a potluck of emotions I felt like Jessie Spano on caffeine pills. If you haven’t seen the trailer yet, you need to hit up youtube stat. If you have seen it, maybe you can relate to all the feels I had. OMG! I can’t believe there’s actually going to be another Bridget Jones movie. I can already picture watching it on the big screen, chomping on delicious, buttery popcorn. Side note: I should make popcorn. BRIDGE!!! You’re a bride!!!! You and Mark are finally tying the knot!!! What’s taken you guys so long? It’s been more than 10 years. Oh, well. It’s happening! Just don’t become smug marrieds, kay? Jude! Shazzer! Bridge’s mum! LOVE the hats, ladies. Are they Philip Treacy? He’s the only milliner I know from across the pond. Okay, he’s the only milliner I know period. Thanks, Royal Wedding! TOM. Looking dapper with a capital D, my friend. Remember when you thought that old couple wanted your autograph but actually your chair was on the woman’s coat? Lolz. You’re a riot. Bridget’s dad! Here’s hoping you two don’t get invited to any tarts and vicars parties this time around. JK! That party will give you stories to talk about for years. Hold on. That was all a fantasy sequence?! Bridget is still single?! Or single again?! What happened to Mark Darcy? WHERE IS MARK DARCY! But yum that cupcake looks amazing. Seriously. Look at the frosting. It’s on point. Who doesn’t love a good pink frosting? Ummm that dress is FIERCE. You snooze you lose, Mark Darcy. If you liked it then you should have put a ring on it. But seriously,why didn’t you put a ring on it? :::::Record Screeching:::::: ED SHEERAN IS IN THIS MOVIE?! Bridget in the workplace! I love Bridget in the workplace! MAAAAAAAAARK! Why are you two broken up? WHY are you ordering big ole drinks? WHY do you look sad? WHAT HAPPENED. :::::Record Scratch #2:::::McDreamy is in this movie?!! And looking gooooood. And making a Cinderella/slipper reference? Is this a shoutout to Enchanted? Why is there no Enchanted 2? That movie was everything. But wait – does this mean no Daniel Cleaver? PREGNANT! Oh, right. This movie is called Bridget Jones’s Baby. But still! Pregnant Bridget? It’s going to open the doors for so many zany, awkward moments! Like this one! I LOVE BRIDGET IN THE WORKPLACE. So wait. Three big questions: Who’s the dad? And why can I never pull off this shabby chic look? And is Daniel Cleaver really not in this one? More of Bridget’s dad! He loves a good sweater vest. Like my dad. Should I get my dad a sweater vest like this for Father’s Day? Putting a pin in that for later. Ohhh so no one knows who Baby Daddy is. That’s interesting. But WAIT. Vote Pamela Jones? Is Bridget’s mum running for office?? Oh, Mark. You’d better be the father. You know how to rock a suit better than anyone. Not that that’s why you should be the father. You should be the father because you’re Mark Freaking Darcy. But you do know how to rock a suit. HOLD THE PHONES. Emma Thompson is in this movie!?!?! Ummm yeah, Mark. You’ve gots to be the father. Look at your face. You love Bridget so much. And Bridget you love him too!!! He’s Mark Darcy of the Reindeer Jumper fame! You’re totally adorable McDreamy and I love you to bits but if there’s one thing for sure in life it’s that Bridget Jones and Mark Darcy are meant to be. Maybe you and Emma Thompson will hit it off? 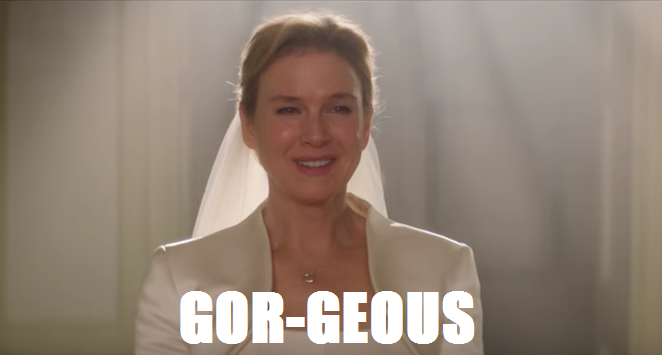 Are you looking forward to Bridget Jones’s Baby? How do you feel about the trailer? Do you miss Daniel Cleaver? Sound off in the comments and let’s discuss. Is this the film of the last book, where she has 2 kids?? Love that McDreamy is in it, that is a reason to watch it on its own. Is McDreamy the same as Cleaver? I’m confused! I like your very enthusiastic post of it, I will be going to see it. Thank you so much, Amanda! I *think* this plot is independent of the books. And I think McDreamy is a new character? I guess we’ll find out for sure once it’s released! I can’t wait!! That makes it even better, woo hoo. I did wonder because in the last book, Bridget is 50 something. Now, I’ll definitely go see it.